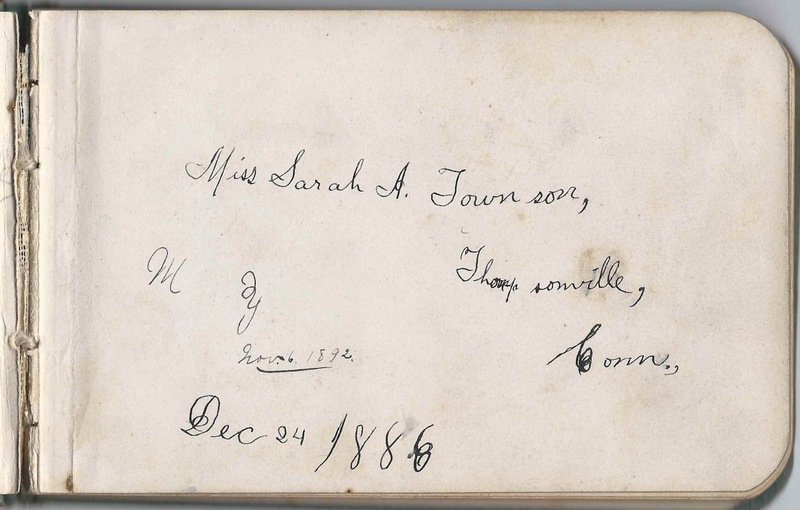 1880s/1890s autograph album of Miss Sarah A. Townson of Thompsonville, in Enfield, Connecticut. 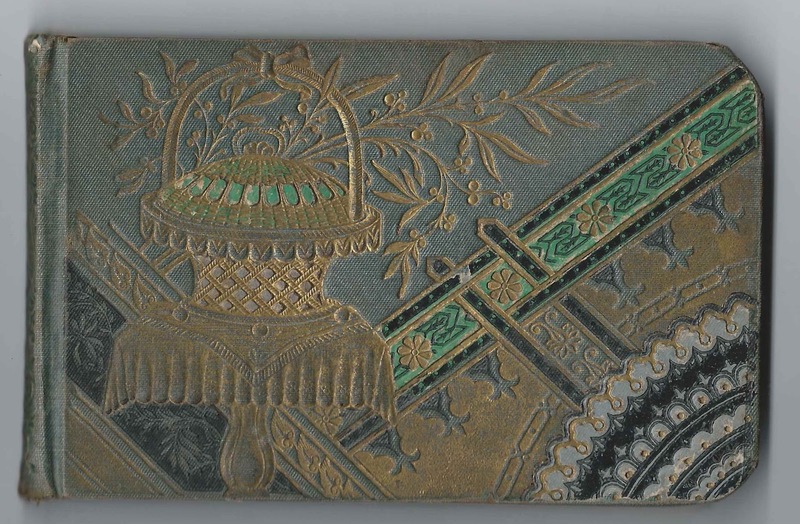 Sarah wrote on the inside front cover and first end paper with dates of December 24, 1886; February 18, 1887; and November 6, 1892. The album is approximately 6-1/2" x 4" and contains the sentiments of over 60 of Sarah's relatives, friends, schoolmates and students. Several of the later pages were signed by Sarah's students at South Manchester, Connecticut, and New Britain, Connecticut. An alphabetical list of the signers appears at the end of this post. 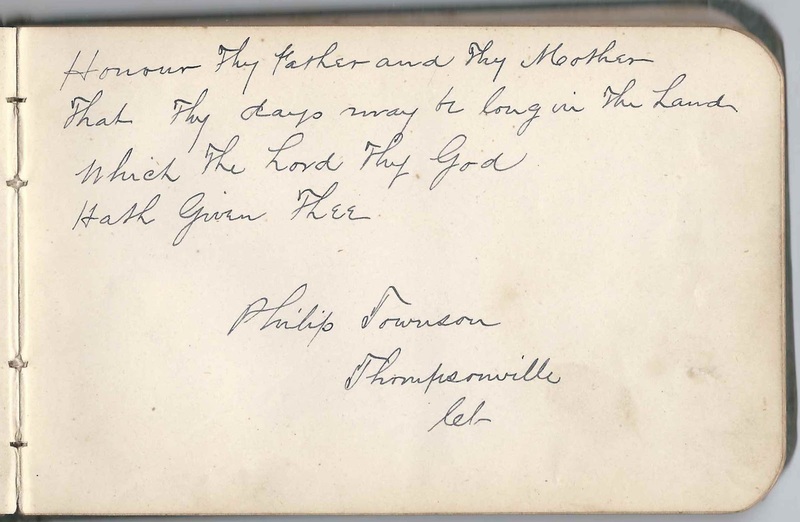 Sarah A. Townson was born about September 1877 in Connecticut, the daughter of Philip and Leona F. (Goodrich) Townson of Thompsonville, Connecticut, who were born in England and Massachusetts, respectively, and who both signed pages in Sarah's album. Also signing were Sarah's siblings, Lizzie, Leona, Lewis and Edward. 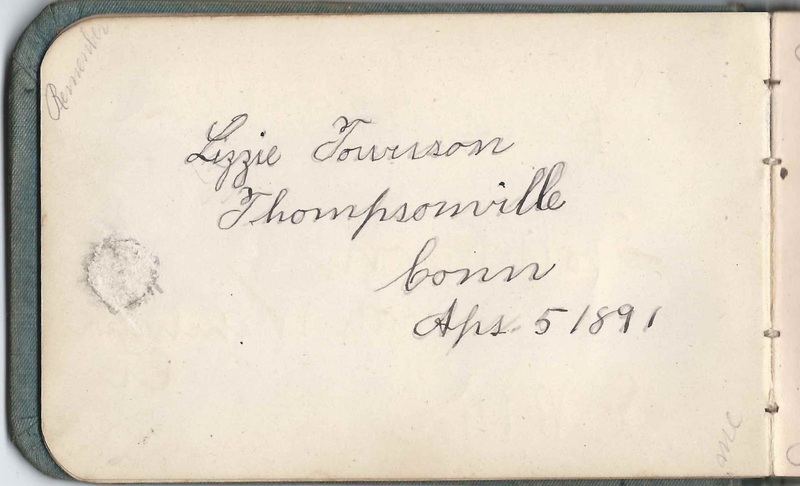 Lizzie Townson of Thompsonville, Connecticut, signed a page on April 5, 1891. Sadly, Lizzie died not long afterward, on August 14, 1892. 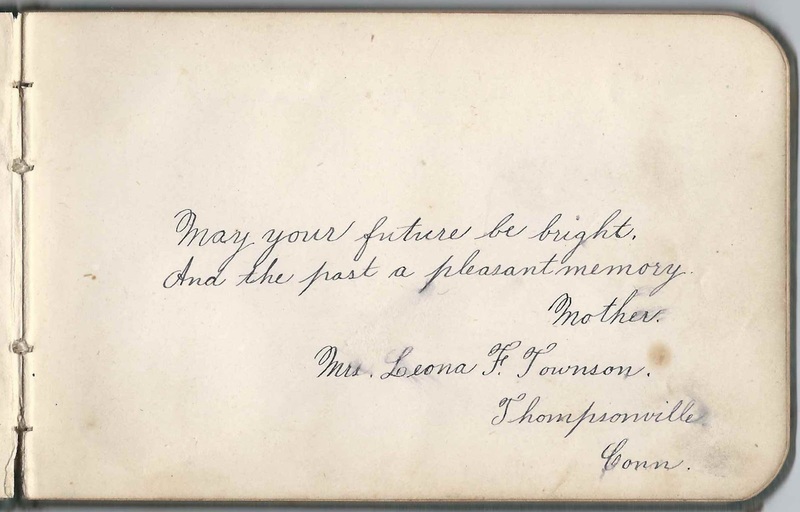 Leona Townson of Thompsonville, Connecticut, signed a page also on April 5, 1891. 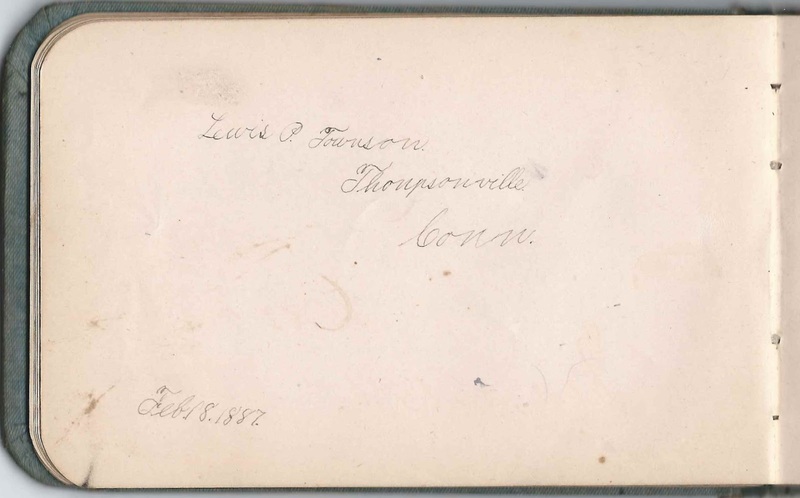 Lewis Philip Townson of Thompsonville, Connecticut, signed a page on February 18, 1887. 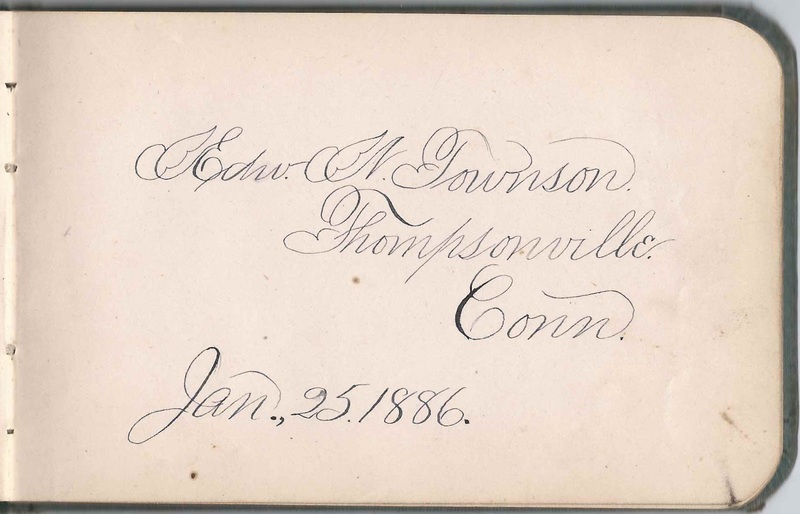 Sarah's oldest sibling, brother Edward N. Townson of Thompsonville, Connecticut, signed a page on January 25, 1886. I couldn't find a record where Sarah A. Townson ever married. She was a teacher in Connecticut. Marion H. Davis of New Britain, Connecticut, signed on March 14, 1899; "Your Scholar"; Sarah's student. Jennie L. Gaines of Thompsonville, Connecticut; T.G.S. 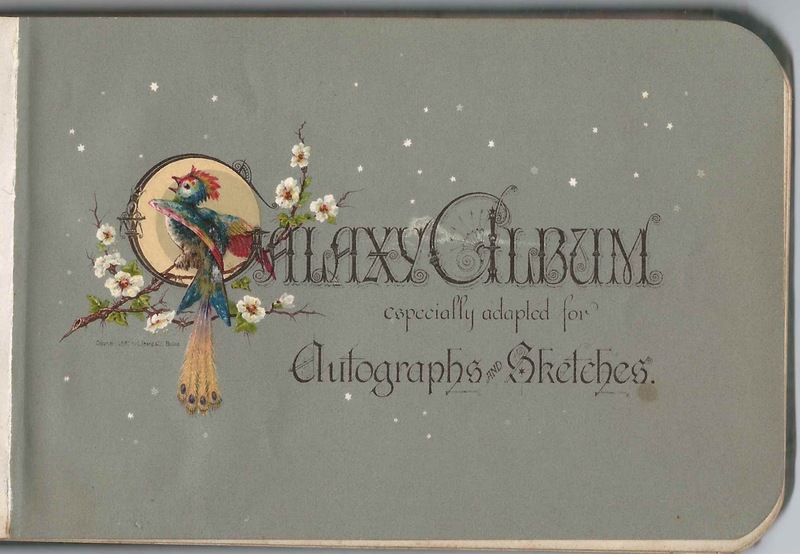 Eddie C. Kapcheske of Box 596, South Manchester, Connecticut; shared the page with Evald Olson. They were presumably Sarah's students. 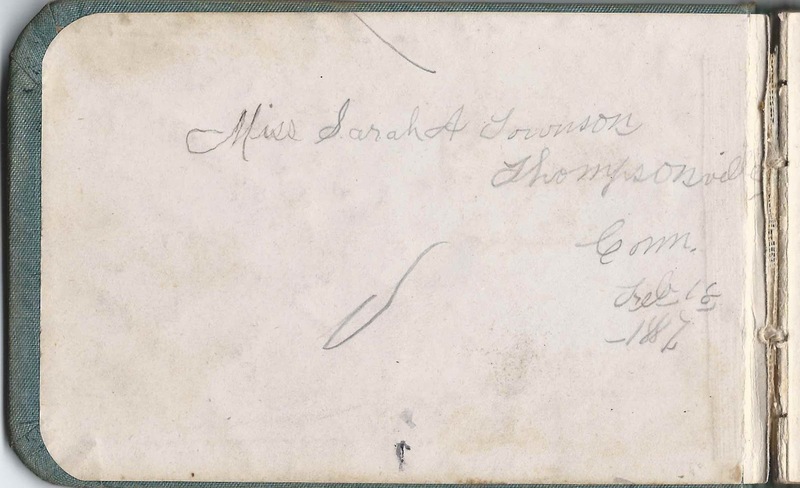 Lizzie Townson of Thompsonville, Connecticut, signed on April 5, 1891; Sarah's younger sister. Sadly, Lizzie died on August 14, 1892. 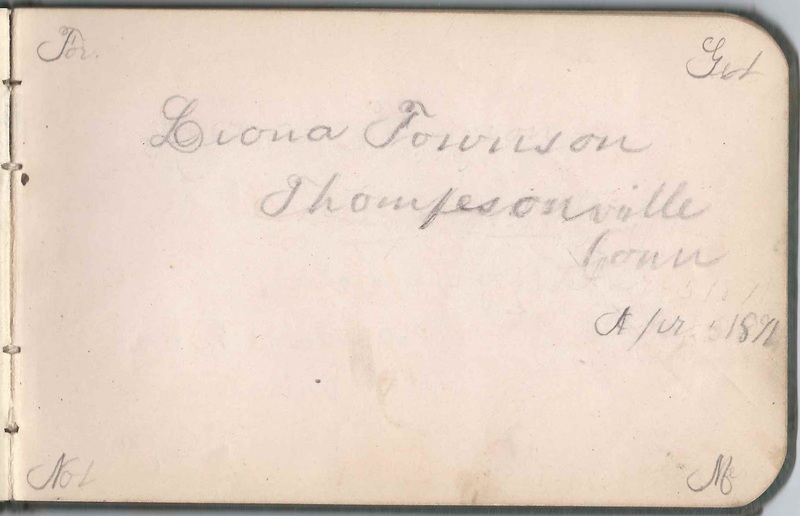 Leona Townson of Thompsonville, Connecticut, signed on April 5, 1891; Sarah's sister. She would marry Frank Dwight Hill in 1908.